Process a customer in less than 20 sec. Get answers online, by phone, on site or by remote connection, either way technical support it's only a click way! Complete Software to manage your store! 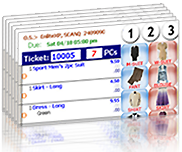 Watch Demonstration of how easy and efficient EnlitePOS for Dry Cleaning is.